Thank you House Foods for sponsoring this post! I once had a not-so-secret obsession with The Baby-Sitter’s Club. I suppose all girls who grew up in the 90s enjoyed a little bit of BSC, and we all identified with one character. For me, I wanted Dawn to be my BFF. She was from California, she was always the chill one in the group, and she loved tofu. She would have been the kind of girl who drank green smoothies before it was a thing. Can you see why we would have gotten along? The one thing that didn’t do Dawn any favors was that she tended to eat her tofu in its raw glory. She was bound to make the other BSC girls squeamish. If I were in Dawn’s shoes, and I wanted to convince others to actually enjoy tofu, I would have dished up a fresh batch of teriyaki tofu. Nothing converts tofu skeptics better than some good pan-fried, sweet and saucy tofu. Trust me on this one. To celebrate National Soyfoods Month, House Foods asked me to share a few healthy ways to enjoy tofu. I decided to showcase two easy tofu recipes that everyone—even people who claim to dislike tofu—will enjoy. First up, I have a pan-fried teriyaki tofu that, in my opinion, is better than what I get at restaurants. It’s naturally sweetened with maple syrup and it’s not overly greasy. This tofu is so tasty, even my meat-loving husband requested that I cook it several times in the last week! Next, I have an herbed tofu dip that’s made with spring herbs, tofu, and greek yogurt. 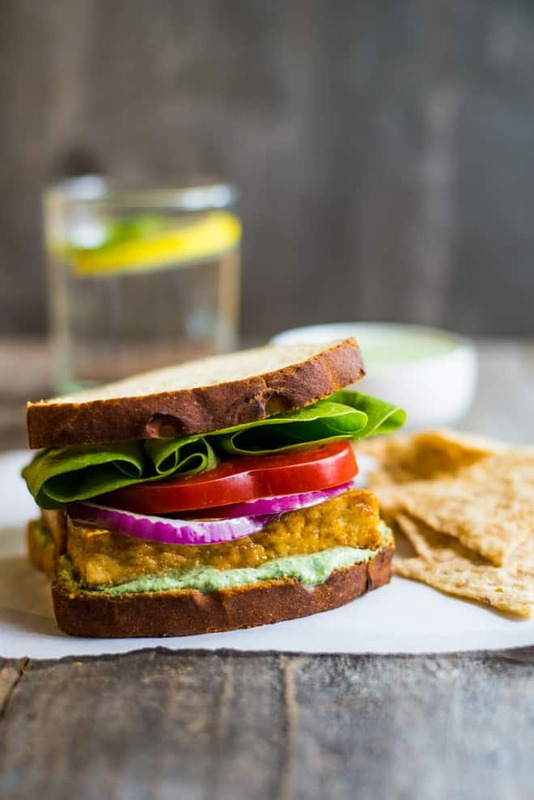 I’m featuring the dip as a spread for the sandwich, but I also love it on my morning toast and as a protein-packed afternoon snack. 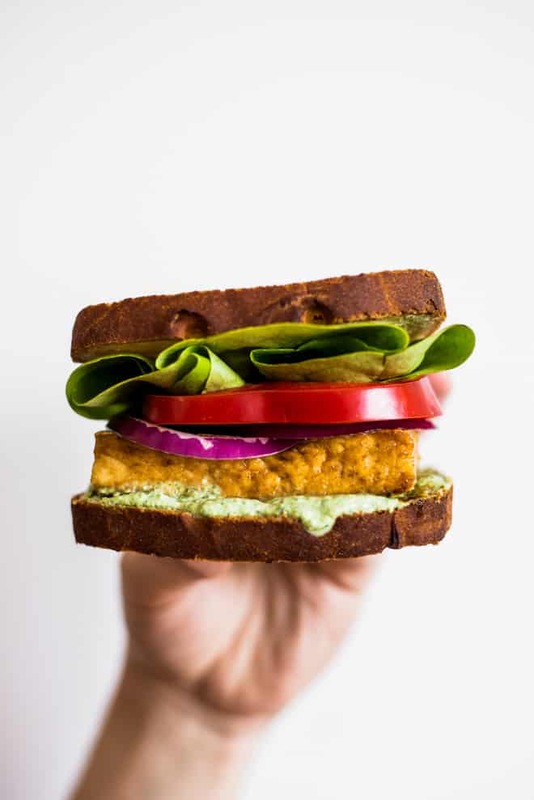 Although the teriyaki tofu and the herbed tofu dip can be enjoyed alone, they taste phenomenal together in this sandwich. We’ve eaten several rounds of these sandwiches already, and we can’t get enough of it! I think Dawn would have enjoyed these, too. Prepping the teriyaki tofu: To get nicely pan-fried tofu with crispy edges, you’ll want to try and get moisture out of the tofu before you pan fry it. Make sure to wrap the entire block of tofu in paper towels and let it sit for 10 minutes before slicing into it. 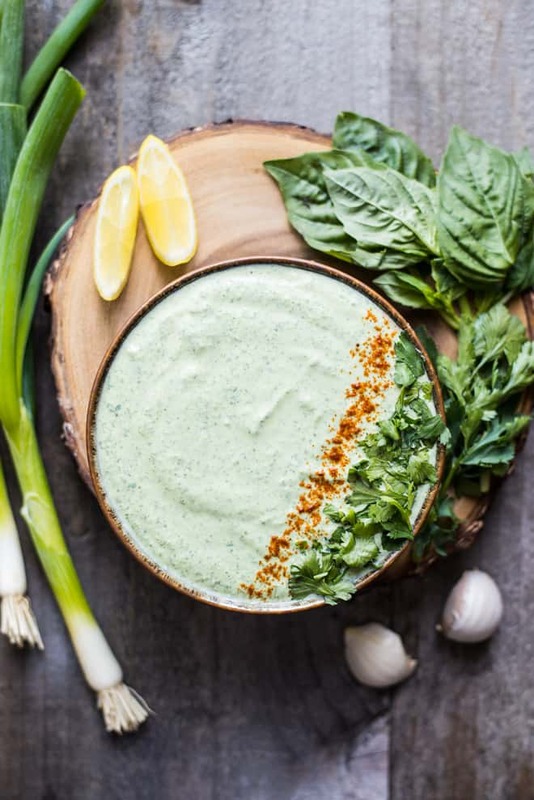 Herbed tofu dip: I tried a version of this dip with a stalk green garlic instead of garlic cloves, and it tasted phenomenal! Feel free to play around with different herbs that are available to you right now. How to use the rest of your soft tofu: You’ll only use about 1/3 of a package of House Foods soft tofu for this recipe. Use the leftovers for your next smoothie or a deconstructed vegan banana cream pie! If you make this recipe, please let me know! Take a photo of your creation and tag me on Instagram so that I can give you a fist bump! Seeing your photos make my day! Herbed tofu dip adapted from Food and Wine. Wrap two paper towels around the tofu and set aside for 10 minutes. Meanwhile, prep the herbed tofu dip. Throw all the ingredients in a food processor and blend until smooth. Taste and adjust seasonings, if necessary. Stir tamari, maple syrup, and mirin in a small bowl. Set aside. Slice block of tofu into 6 slices. Over medium-high heat, heat a pan with 1 tablespoon of sesame oil. When the pan is hot, add tofu slices. The tofu should start sizzling as soon as it hits the pan. Fry each side for 4 to 5 minutes, until golden brown. You can also brown the edges for about a minute. Plate fried tofu. Reduce heat to medium-low and pour teriyaki sauce into pan. Add tofu pieces back to the pan and cover them in the sauce. Turn off heat. 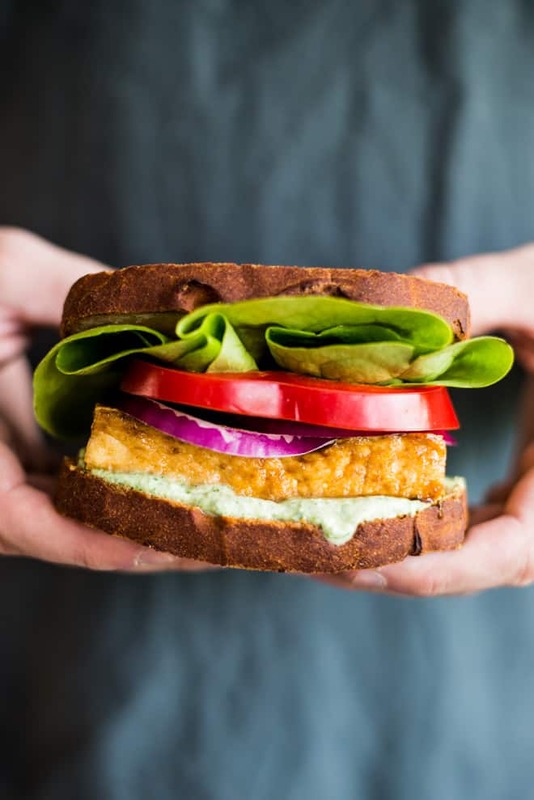 Build your sandwich with the herbed tofu dip, teriyaki tofu, red onions, red pepper, and lettuce. 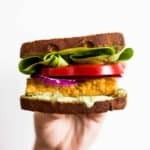 If you are using small slices of bread, you’ll only want to use 2 slices of tofu. If you have a larger slice of bread, use 3 slices. Another big virtual hug to House Foods for sponsoring this post! I am so grateful to be able to work with brands that I trust and share recipes that I know you’ll enjoy. Please note that the link to the food processor is an affiliate link. Ohhh this looks awesome, and LOL about Dawn… I believe I was slightly too young when that show was popular, but I still appreciate the reference. I’ve been loving tofu lately (have eaten it twice this week!) and am on a mission to make my fiance enjoy it too. I’m going to try this teriyaki version next time and maybe that’ll win him over! Heey Lisa, IDK about the Baby-Sitters Club, but I agree. Dawn would love this! I’m thinking Rob would go for it too! 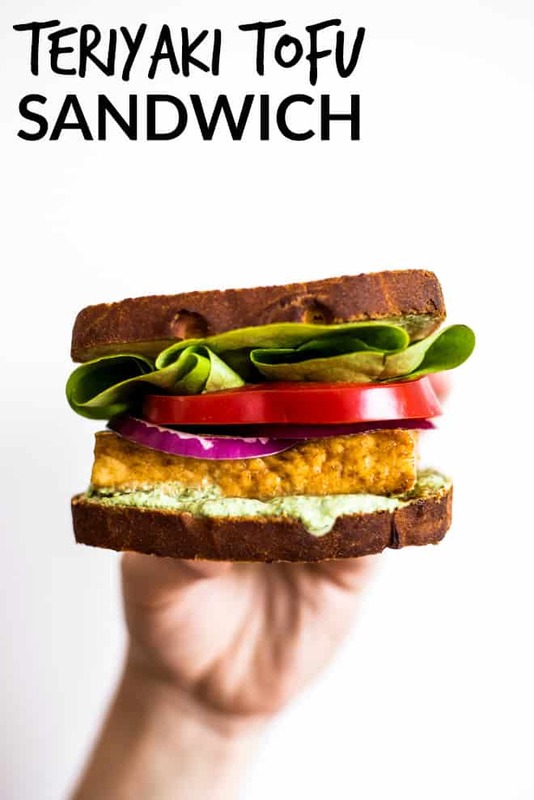 I am a fan of tofu but have never tried it on a sandwich. Thank you for the nudge! 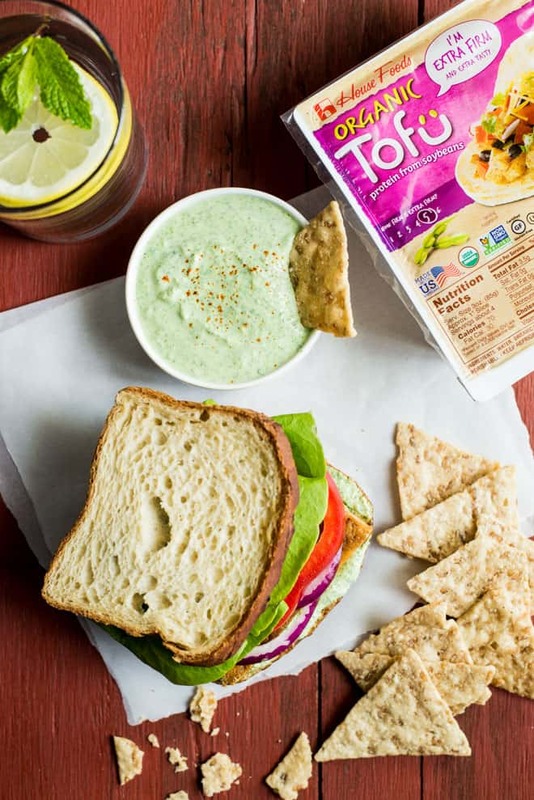 This is fabulous, as is that herbed tofu dip! Yes Please! Tofu in sandwiches are wonderful! I know you’ll love it, Traci! Another stunner Lisa! I am blown away by the colors, the vibrancy, the freshness. I just want to take a big chomp out of that gorgeous sandwich! I had to be a fault finder, but in the instructions you tell us to wrap the tofu around the paper towels. I think it should be the other way around – the paper towels around the tofu. Hi, Juanita. Thank you so much for letting me know about that! I’ll change the instructions right now. And I can’t type either! The previous comment from me should read “I hate to be a fault finder…” not “I had to be a fault finder” … Sorry!